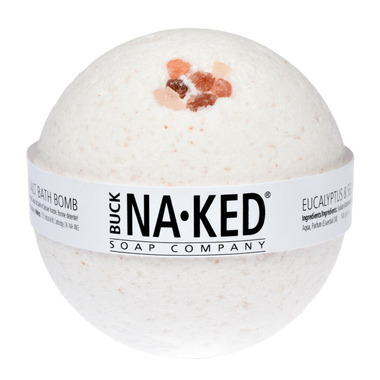 The Buck Naked Soap Company Bath Bombs are hand-packed containing ultimate fizzy luxury! Each bath bomb has been designed to create a mood and set the tone for an amazing bathing experience. This bath bomb is a great complement to the Himalayan Salt artisan soap. How to Use: Place bath bomb into bath and allow it to dissolve. Sit back and enjoy your bath! While our bath bombs are intended for one use, it is encouraged to cut them in half or crush them for multiple uses. Discontinue use if irritation occurs. Love that this bath bomb has natural and safe ingredients. It smells great and leaves skin feeling so soft. This product smells great!!! Will buy again. This product smelled pretty, but no bubbles at all. I was hoping for bubbles. Will not buy again. I've purchased this bath bomb many times because it's not overly scented, and it's relaxing. Other brandslike lush have caused me problems..this brand doesn't. Wonderful smell and leaves my skin feeling so soft! My favourite bath bomb yet. Amazing bath bombs! Long lasting, smells great and left my skin so soft. Will definitely buy this again. I didn't like this product at all. The bomb barely dissolved in my water and it was a very oily bath. These are great, but really strong. I usually cut bath bombs in half, these you could quarter.